People from all over the world watched as the spire with ‘the bells of Notre Dame’ fell. Some mourned, some cried, some prayed and some sang. There were those who mourned for the building–an 800-year-old structure that seemed to be one of the most recognizable and revered churches in the world. To anyone who appreciates architecture, history, and even stained glass, it was a beautiful structure. But, of course, it was more than that. This was a building which was a church…a place where millions have visited, and many thousands have worshiped. For some, the symbol of Notre Dame represents more than a specific Roman Catholic cathedral in a specific city…it represents the Church, in general. The fact that it burned…is symbolic of what’s going on in ‘The Church’ all over the world. It is possible, after all, to ‘worship’ THE BUILDING…and all it represents–without really ‘worshiping’ the Lord who is the Reason for the building. It is possible to ‘worship’ RELIGION, and all it represents…and to miss the One that our religion was founded upon. I believe one message from God for those of us who are believers today is that He is not confined to a building! God, after all, is Lord of the Universe–He cannot be contained in a building! Therefore, He is worthy of our worship, praise, surrender and obedience no matter what happens to our buildings. This week, Christians around the world will celebrate the death, burial and resurrection of Jesus. He is the Lord of Creation, the One who gave His life to pay for our sins, and the One who gives us LIFE–Full Life and and Eternal Life–through faith in Him. He is the One who deserves our focus, our prayers, our full-on-worship. Those are the truths that we are called to fix our minds on today…and That is the reality that enables us to worship Him fully–not just during ‘Holy Week’, but at all times! No building can contain Him, and He is worthy of our praise and worship everywhere we go. 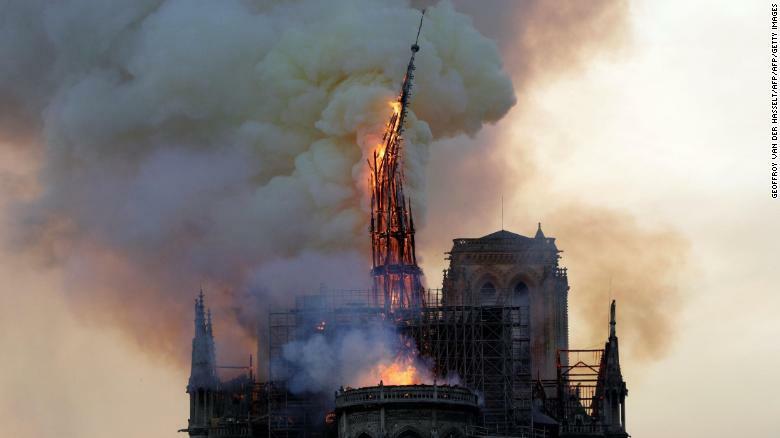 The burning of a beautiful, historical cathedral during holy week can do one good thing: It can remind us that our hope is not in our church buildings, and our hope is not even in our religion. Our hope is in the Lord Jesus Christ, who, by the grace of God, took our sins upon Himself and paid for them with His life. He conquered sin, death and the grave…and HE–and He ALONE–deserves our all-out-worship! May we focus on Him today! One-legged ladders: Ineffective and dangerous! I admit that I’ve never tried to use a one-legged ladder–a ladder where a portion of one of the legs is missing. However, I have tried to use an uneven ladder, where one leg is on the ground, and the other leg is a few inches off the ground, because of a hill. Even with pieces of wood underneath, it’s dangerous an un-advisable. Everyone knows that using a ladder in this way is unwise. It would be even more foolish to try to use a ladder where the lower foot of one side is missing. That ladder would rightfully be called ‘broken’ and should be tossed out. We recently celebrated what most call ‘Easter’–the day that celebrates the single most momentous occasion in the history of the world: The miraculous resurrection of Jesus! Now, I’m aware that there are many who don’t celebrate this–for many reasons. Some believe in other religions, some believe that ‘miraculous’ things, by definition, can’t happen–and therefore, this event is simply folklore. Others believe that Jesus of Nazareth never really existed. If you fit into one of those categories, this blog is not for you. Save yourself time, and stop reading. Others fall into 2 groups: Group 1 believes it all–and celebrates accordingly; Group 2 believes that Jesus lived, did remarkable things, taught profound truth, and then died via crucifixion…but don’t believe in the resurrection. If you fall into Group 2 I want to remind you of something. Celebrating Good Friday without celebrating Resurrection Sunday is like using a one-legged ladder. It’s unbalanced, dangerous, and makes no sense! This is the “Jesus Christ, Superstar” version of these events. Many of you may have watched the live version Andrew Lloyd Webber’s Musical on Sunday night. Although done with excellence and creativity, I was reminded, as it ended, that it presented Jesus as a conflicted, tormented man who died for a noble cause, but was misguided in doing so. The last scene in the musical shows Jesus on the Cross…an important scene but NOT the end! It conspicuously avoids the resurrection. Jesus, it must be said, was NOT ‘conflicted’. Human, to be sure…but He knew His Mission! The point is this: If you’re going to tell the story of Jesus, you MUST tell the whole story–including the resurrection! If Jesus isn’t raised, then none of this makes any sense. In that case, He died as a misguided man. C.S. Lewis, Mere Christianity (1952; Harper Collins: 2001) 51-52. It is important to note, that IF Jesus merely died on the cross, but then stayed dead, then he was no different than many other self-deluded ‘messiah’s’ throughout history. IF, on the other hand, He rose from the dead, then that shows that He was who He said He was, and His death did have the power to be the ‘atoning sacrifice’ (see Romans 3:25; 1 John 2:2), and make forgiveness, and Eternal Life, possible for us who believe! The Cross is Mighty–but only because of the Resurrection!